Around 50% of Estonia is covered in forest. 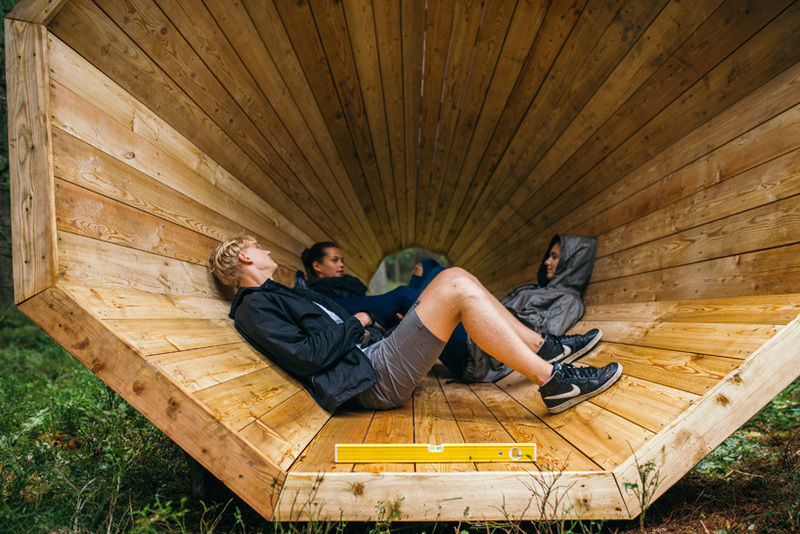 This past August, in one of the most remote corners of untouched nature, interior architecture students from the Eesti Kunstiakadeemia (Estonian Academy of Arts) in Tallinn constructed three megaphone-shaped structures as a hidden forest library, where sounds of the surrounding woods are amplified into the spaces for reading, solitude, and even meditative music performances. The project called “Ruup,” shared by Designboom, was revealed last month in the Pähni Nature Centre. As BLDGBLOG pointed out, the design by student Birgit Õigus is reminiscent of the acoustic mirrors of World War I, used by the United Kingdom to amplify the noise of incoming German zeppelin raids (one of these concrete mirrors had a restoration completed earlier this year). 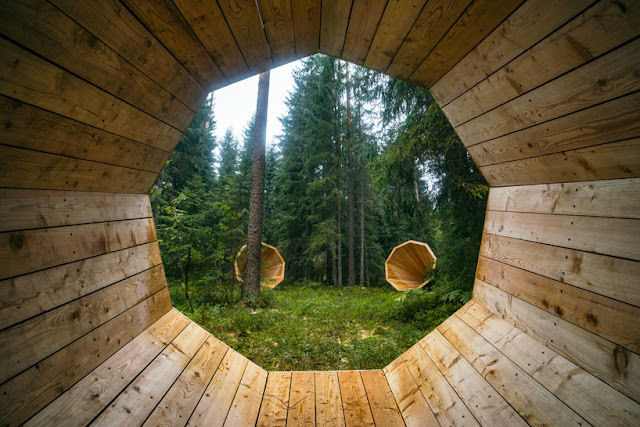 No audio is yet available online, but as architectural installations, the wooden cones appear as unobtrusive constructions among the trees, offering shelter while opening an oculus view to the surrounding forest. Writer Valdur Mikita, whose idea of a “forest library” influenced the project, stated that the “trademark of Estonia is both the abundance of sounds in our forest as well as the silence there,” adding that in “the megaphones, thoughts can be heard. It is a place for browsing the ‘book of nature,’ for listening to and reading the forest through sound.” The installation mixes the serendipitous feeling of stumbling on an Andy Goldsworthy construction (although not quite as primordially formed), with nature sound interventions like those in the Musica Impulse Centre for Music’s Klankenbos (Sound Forest) — where Robert Lambermont’s wooden “Noah’s Ear” (2010) listens in on the changing seasons, and Hekkenbergarchitects’s “Tacet” (2008) has a solitary glass cube that muffles the noise and allows visitors to view the forest in total silence. “Ruup” is both an invitation and an escape to experience nature more intensely through a basic architectural form that fades into the forest.